We recommend a minimum total of TEN statute and case references per question. 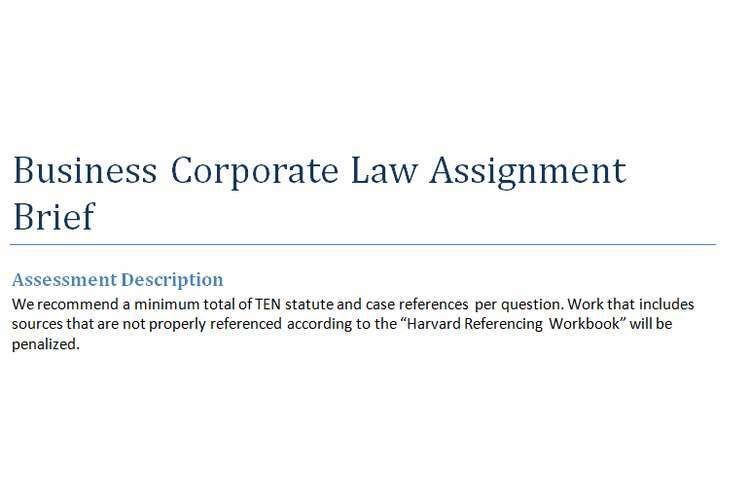 Work that includes sources that are not properly referenced according to the “Harvard Referencing Workbook” will be penalized. Jack, Jill and Max are the owners of a very successful business selling trucks. They have been in business for only 12 months and have not organized a formal business structure. The business is growing rapidly and they want to update their business structure to a more appropriate structure. They seek the advice from you (a corporate adviser). You advise that they have a number of options all of which have advantages and disadvantages. Marty is the only director of Child Toys Supreme Pty Ltd (Child Toys) which makes and sells cheap children's toys in Australia. The company has a salesperson, Betty. Betty has promised retailer customers that the toys have no harmful plastic chemicals in the toys and this is not true. The retailer customers lose sales when the truth comes out about the toys’ chemical elements. A child is seriously injured because of the harmful chemicals in the toys. For the past five years Charles has been the Operations Manager for the company. Due to his senior position Charles knows the identity and requirements of the company’s major clients. In March this year Charles decides to retire. As part of his employment contract with the company Charles has agreed not to compete against the company for two years. In June this year Charles and his wife, May, decide to start a business selling children’s toys in competition with Child Toys Pty. Ltd. May forms a company to run this new business, Better Toys Pty. Ltd. May is the sole director and May and Charles are the sole shareholders in the new company. May and Charles approach customers of Child Toys Pty. Ltd offering to sell toys. What types of corporate law liability can Child Toys Pty Ltd be exposed to because of Betty’s actions? We recommend a minimum total of TEN statute and case references per question. Work that includes sources that are not properly referenced according to the “Harvard Referencing Workbook” will be penalized. Refer to the Academic Learning Skills handout on Report writing. Please see Academic Learning skills staff for assistance with this, or any assignment. Marks will be deducted for late submission - 5% deduction per calendar day late, of the total mark is applicable. However, consideration may be offered only under medical ground or other extenuating circumstances. You must provide appropriate supporting documentation for consideration. Please be aware that any assessments submitted in formats other than Microsoft Word will be considered LATE and will lose marks until it is presented in Word format. No paper based or hardcopy submission will be accepted. Our Academic Learning Support (ALS) team is there to help you with understanding the task and all other assessment-related matters. For assistance and to book a one-on-one meeting please email one of our ALS coordinators (Sydney ALS_SYD@kent.edu.au; Melbourne ALS_MELB@kent.edu.au). For online help and support please click the following link and navigate Academic Learning Support in Model.